I want to know more about him, this soldier who shared my last name. Who was he, where is his grave, what happened? The online search is slow at first. Lots of dead ends, searches that result in information on other Dearlove casualties, but not A. Dearlove. The Commonwealth War Graves Commission reveals that he was buried at Tyne Cot Cemetery, and that he served in the East Surrey Regiment, 2nd Battalion. The site also has information on 21 other Dearloves who died in World War 1, including Albert Shirley Dearlove, a bandsman with the King’s Regiment. Of the 22 Dearlove casualties, none are officers. We’re a humble lot. 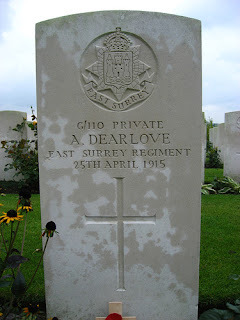 A. Dearlove still doesn’t have a first name, and I don’t know how old he was when he died. These two things feel important to me. A. Dearlove was Albert Dearlove. He was born in Fulham, Middlesex. He was killed in action. That’s it. I turn to Wikipedia, wondering what happened on April 25, 1915, the day Albert Dearlove died. He met his end on the fourth day of the Second Battle of Ypres in Belgium. Albert’s battalion was on the front line, the 1st Canadian Division holding the line to his left. Three days before his death, he would have witnessed the first use of mustard gas on the Western Front. He died on the second day of the Battle of Saint Julien, probably the victim of a German artillery shell. My search for more information on Albert Dearlove has not been successful. I can find no birth record, so I don’t know how old he was. I don’t know who his parents were, whether he had brothers or sisters, or whether we are linked by anything other than a last name. All I know is that he died far from home, far from his family, surrounded by horrific events. Albert Dearlove was one of 885,138 British soldiers who died in World War I.
Hi – My father, Richard Frederick Dearlove, was born in Fulham, so I thought the Albert Dearlove might be a relative. However, I can’t find him on our tree. My Grandfather was Duncan Bennett Dearlove, his father William James Dearlove (1818-1885) and his father William (no dates). All London based. Seemed probable that we’d have been related somewhere along the line – it may just be a missing link somewhere – often happens.